If You Had A Father…. …and you did, if you’re still standing in this world. Mine is a good man, who worked hard, because that’s what a real man did for his family. He had one little boy, then another, and a third, and finally my mother got an ally, my baby sis. Dad was a basketball star, a talented carpenter and cabinetmaker who built our first house with his own hands in his “spare time.” If he was quiet, he was affectionate and a mountain to aspire to as a child. We wanted to be like him. We were in awe of him, And he was there, always there. Even if he traveled, he always came back. Not all Fathers live up to that, but if they don’t, they aren’t really Fathers. The fathers God gives always show up, hang in there, are there for you. Yours might have been Uncle Joe or Grandpa or somebody you weren’t related to, but they always came back. My wife had a father like that—engineer, Dale Carnegie graduate, never came out of the room without being dressed for work at the mill. No complaining, no excuses. If it’s hard, overcome it. If it’s broken, fix it. If you can pay for it, it isn’t a problem. We’re in this world to do for others, not ourselves. 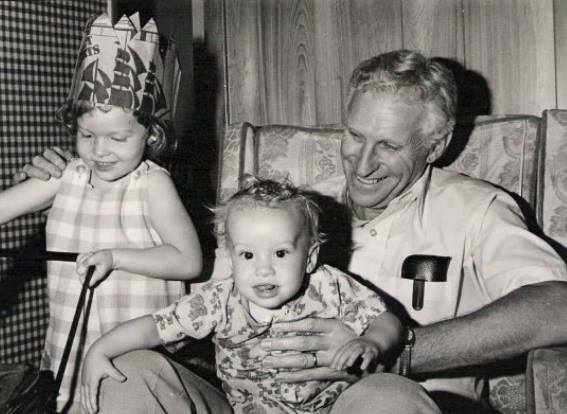 My father in law, Forrest Johnson, with my two oldest girls. These two men, along with a pretty long list of men who “fathered” me in sports, church and school, grandfathers and neighbors and Sunday School teachers, fathered me. “Fathering,” to me is this: you take responsibility for the people you love. You protect the weak. You help and defend the helpless. You stand up for what’s right and mend what’s wrong. Fathering means helping little boys and girls know what a good man acts like. It means sacrificing, working, helping and coaching. It means helping them grow up when you’re still growing up yourself. It means doing whatever you can for your children because they come first. If you had a father, and if you’re functional, you did. Even if that father wasn’t your biological Dad. If a man adopted you, looked after you, grandparented you, was your Scoutmaster or teacher or coach, you had a father, then you were blessed. I count myself blessed with all the Fathers in my life—mentors, teachers, masters, spiritual guides. And so should you. Look away from it if “father” is painful for you. Look through that to see the real fathers God put around you to be one you deserved. Somebody who was sure you had enough to eat and something to wear, or worried about you even if they lived far away. A father is a great gift. Fathering has been hit hard in recent years. A lot of the old traditions have been blistered with criticism, and we’ve deserved plenty of it. But along with those who treated being father with being a bully who squelched everyone else, there have been billions of fathers who, in the times they lived, held their shoulder under their homes and families without complaint. I see a lot of good fathers, young fathers, now, who are conscientious about their fathering, and it gives me hope. Their girls need them to show them that real mean respect women and believe in them just as much as boys. Their sons need them to show how to control tempers and treat neighbors and reign in their impulses for the good of the world. I would encourage them not to worry about the mistakes. Just show up and do the hard stuff right. If you have a father, somewhere in this world, who was the bridge you got to stand on to pass over the hard places, count yourself fortunate. And I suspect, if you’ll think a moment, not about the title but the job description, they’ve showed up when you least expected it. In honor of my Dad, Al Furr, and in memory of my late Father-in-law, Forrest Johnson. Thank you. Posted on June 18, 2017, in Children, Culture, Family, Fathers, Modern Life, Parenting, Uncategorized and tagged anger, boys, daughters, family, father, Father's day, men, Mentors, parenting, relationships, responsibility, sons. Bookmark the permalink. 4 Comments. I’ve been privileged to know your Dad a bit over the years and play some music together with this gentle giant of a man/father. And, the apple doesn’t fall far from the tree. Thank you for writing this wonderful article. My father died when I was six, but I had a wonderful family friend that stepped up to fill in and was a loving influence on my life. Thank you for reminding me to be thankful for this great man that God put in my life. Thank you, Terry. I appreciate your sharing this. Thank God for those good men! Thanks, Don, I am so glad you’ve gotten to know Dad, too. Your friendship to me is a gift.